Melissa & Doug, one of the best names in the toy business– and for good reason! Their toys are always made to the highest of quality and exude bright colors and patterns to keep your babe intrigued. Classic toys for all ages that promote fun and imagination, you can always count on Melissa and Doug to bring to your babe the perfect toy that enables early learning and self expression. We absolutely adore their slice and bake cookie play set– I mean, these cookies look so good we would eat them, not kidding! 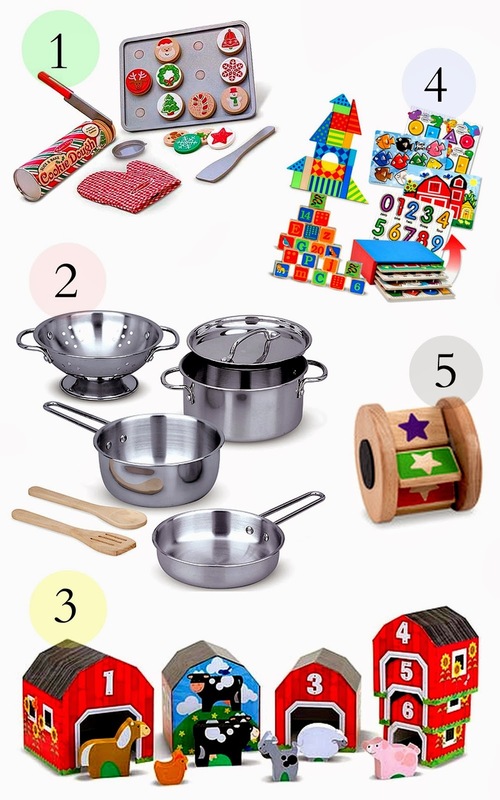 You must check out their stainless steel pots and pans set, like now– seriously adorable and will make the perfect addition to a little play kitchen for the holidays. Melissa and Doug has so many amazing toys to offer– so you can imagine making a favorite list was quite challenging, but here you go! Take a peek at the toys that our tots just can’t live without. Go check out Melissa and Doug today for your little tots holiday list, and hurry— they have amazing deals and are currently doing a free gift with your purchase over $50.00 and free shipping over $19.99- whoa!